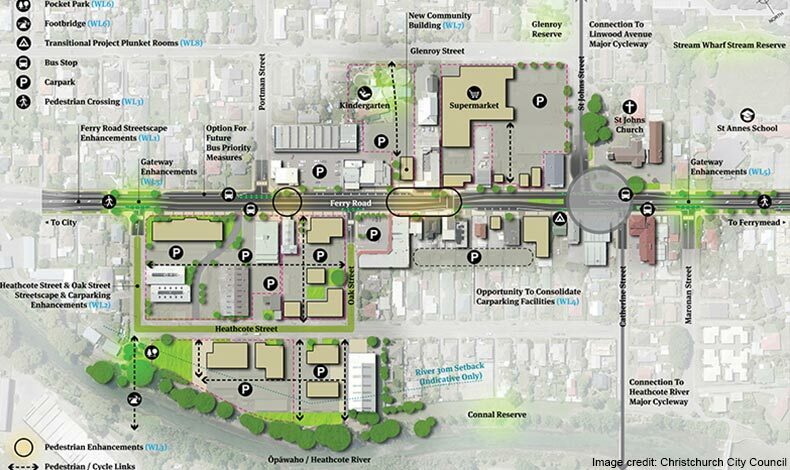 The Ferry Road Master Plan was developed to support the recovery of suburban centres along Ferry Road from Fitzgerald Avenue to the Ferrymead Bridge following the Canterbury earthquakes. The plan also aims to improve the safety and amenity of the road corridor. Ferry Road is an important arterial route that connects the city to the sea and performs several key transportation functions for the whole city. It links the city’s seaside suburbs and port with the central city and provides services for a number of communities along its route. Commercial centres along the route include Phillipstown, Woolston and Ferrymead. The Master Plan outlined a vision, goals and actions to respond to technical challenges and community aspirations for the corridor and centres. While preserving the strategic transport function of the corridor, greater emphasis on place-making in each commercial centre will encourage social interaction, bring visitors, promote increased business opportunities and help to build future economic resilience. Higher quality walking and cycling environments are proposed to connect with key recreational routes. A range of public realm improvement works are proposed to reflect the history of the area, local ecology and to address a range of streetscape challenges arising between different user groups. Boffa Miskell provided urban design advice, with a focus on defining the overall vision and actions, understanding the implications of the Corridor Study findings for Ferry Road and developing streetscape and commercial centre design concepts. The designs sought to address a range of conflicting issues with a focus on developing a stronger sense of place for each location. Urban design workshops were undertaken with key community stakeholders for Woolston and Ferrymead to explore the development of urban design principles to guide future development.